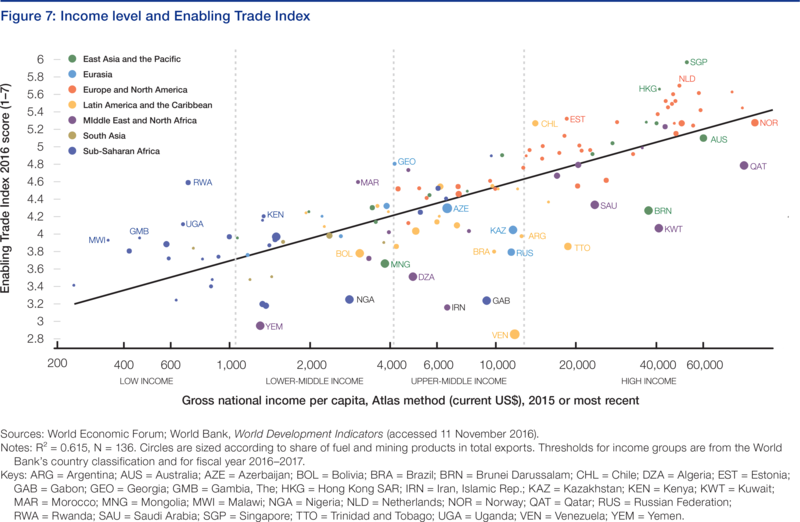 Not unexpectedly, advanced economies are better at enabling trade than developing countries (Figure 7). The 20 best performers and 28 of the top 30 are advanced economies. At 21st, Chile is the top-ranked emerging economy in the Index.22 Advanced economies typically enjoy lower trade costs not only because their tariffs are low, but also because economic development itself is intimately associated with enhanced capabilities in administration, infrastructure and telecommunications, and regulation. Trade and development feed off each other, as explained in Chapter 1. As in previous editions, the 2016 ranking remains dominated by small open economies, with Singapore confirming its top ranking followed by the Netherlands, Hong Kong and Luxembourg. The European Union places eight countries in the top 10, and 13 in the top 20, showing the benefits of deep regional integration. Together, Europe and East Asia hold the first 20 places of the ETI, consistent with their status of trading hubs at the heart of the global production networks. Globally, the capacity of countries to enable trade has improved but almost to a negligible degree. 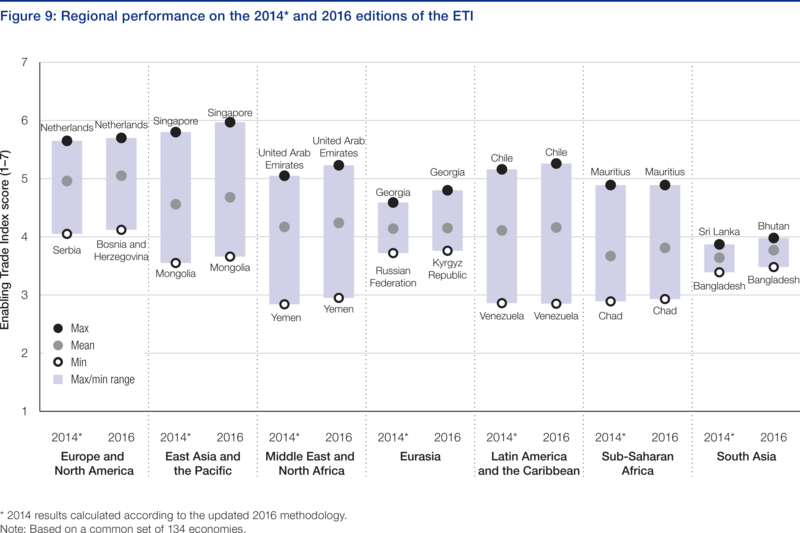 The average ETI score of the 134 economies covered in both the 2014 and 2016 editions has increased from 4.3 to 4.4. Not surprisingly, availability and use of information and communication technologies (ICTs) is the area where improvement has been most significant across all regions, with countries increasingly adopting information technologies (see Figure 8). Market access has also improved, while efficiency of border administration has stalled. The trend of the past two years has not been rosier across other drivers of trade. Availability and quality of transport infrastructure has generally stagnated, and it has actually decreased slightly in Sub-Saharan Africa and the Middle East and North Africa (MENA). The deterioration in transport services is more pronounced and spread across more regions, potentially reflecting the difficulties experienced by the shipping and logistics sector worldwide. Delving into regional performances on the overall ETI, Europe and North America remain the regions with the best environment for trade, followed closely by the East Asia and the Pacific (EAP) region, which has reduced its gap over the past two years (see Figure 9). Trade champions from other regions, such as Chile (21st), the United Arab Emirates (23rd), Mauritius (39th) and Georgia (41st), perform at par with European and North American countries and above the EAP average. Intra-regional variation is particularly large in East Asia, the Middle East and Latin America, where the lowest-performing countries (Mongolia, Yemen and Venezuela, respectively) lag more the 100 places behind the first. South Asia showed disappointing improvement and becomes the worst region at enabling trade (overtaken by Sub-Saharan Africa). 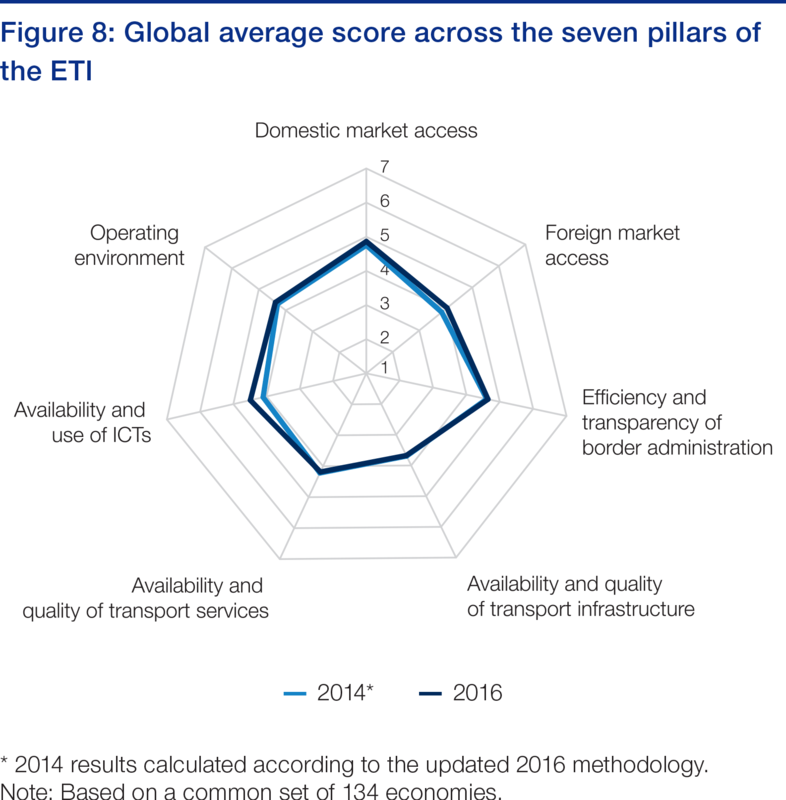 Among all regions, the region made up of Europe and North America achieves the highest score in four of the seven pillars of the ETI, including Efficiency and transparency of border administration, Availability and quality of transport services, Availability and use of ICTs and Operating environment. East Asia and the Pacific boasts the best domestic market access and availability and quality of transport infrastructure, while Sub-Saharan Africa is the region with the best access to foreign markets. 22 Based on the International Monetary Fund’s classification of countries (situation as of October 2016). 23 Positive outliers were identified based on the deviation from the ETI scores predicted by a simple linear regression of actual ETI scores on the log values of GNI per capita. Rwanda presents the largest deviation between actual and predicted (1.02 point), followed by Singapore (0.81), Malawi (0.62), Hong Kong SAR (0.60), and Chile (0.59).